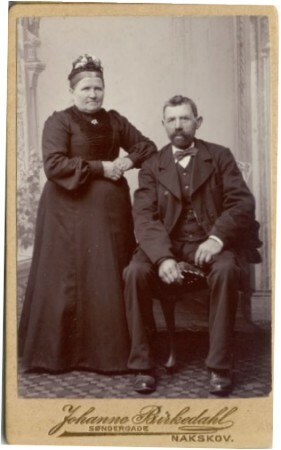 This is one of 10 photos (see below) that were in the photo album of Jens Rasmussen Hai (1844-1927) from Tillitse, Maribo, and his wife Ane Margrethe Frederikke Sophie Pedersdatter (1843-1918) from Gloslunde, Maribo. The family came to America in 1879 and settled in Aurora Township, Steele County, Minnesota. Anna Christine Rasmussen (1867 – ? ) Born at Tillitse. Bolette Sofie Rasmussen (1870 – ? ) Born at Gloselunde. Marie Rasmussen (1873 – 1962) Born at Tillitse. Rasmus Peter Rasmussen (1884 – 1977) Born in Aurora Township. Rasmus Peter was married to my grandfather’s sister.